Laurie Niles: Tell us about your new album! 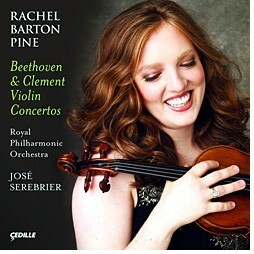 Rachel Barton Pine: My new album is the Beethoven violin concerto, paired with the world premiere recording of the violin concerto by Franz Clement, who was Beethoven's dedicatee. What's fascinating about it is that both concertos were written for the same annual benefit concert for the orchestra where Clement served as concert master, exactly one year apart. Clement's came first. It's in the same key, it's the same length, the same instrumentation and the same aesthetic approach to the violin as Beethoven's concerto. Beethoven is positioned almost equidistant from Mozart and Mendelssohn, in terms of musical time periods. But we really don't hear many concertos from the time of Beethoven, except, very rarely, maybe a Rode, Kreutzer -- some of the French violin school, which was a very different aesthetic. The French aesthetic was much more full-blooded, very much more flashy in its virtuosity, much more the idea of the soloist playing the melody line at all times with the orchestra being much more complementary. Clement's concerto, however, has all those characteristics with which we associate Beethoven's. The violin solo part plays very much in the upper registers of the instrument, with very delicate figurations. Actually, it has many of the exact same figurations as Beethoven's concerto. Laurie Niles: And the Clement came before the Beethoven? Rachel Barton Pine: Clement's concerto came one year earlier. It was actually premiered the same night Beethoven's Eroica Symphony was premiered. By the way, that story about Clement, that he supposedly played his violin upside down in between the first and second movements of Beethoven's concerto when he gave the world premiere performance -- that's an urban legend. I've seen it repeated in almost every program, when I've performed at Beethoven. But Clement didn't play his own composition in the middle of Beethoven's concerto; he didn't play his own composition till the second half of the concert that night. I don't know how that story got started, but the fact that everybody accepts it as fact does kind of a disservice to Clement, portraying him as sort of a vaudeville violinist. It's very clear, looking at his concerto, that he was a serious artist. His violin concerto certainly has a number of virtuosic elements, but it's clearly written as music for the sake of music, not showing off for the sake of showing off. This was very different from the French school. Also, the orchestral instruments play the melody a lot of the time, with the soloist playing descant. This is something that we consider so radical in Beethoven's concerto, but in fact, Clement did it a year earlier. It's fascinating to realize how Beethoven was so obviously influenced by the particular violinist (Clement) for whom he was writing. For another example, look at Beethoven's Kreutzer Sonata. In fact, the Kreutzer was premiered by George Bridgetower, together with Beethoven. The original dedication actually was to Bridgetower. In my Black music research, I've read everything there is to read about Bridgetower, for whom the sonata was actually written. It really should be the Bridgetower Sonata; Kreutzer never even played the thing! But Beethoven ultimately withdrew the dedication to Bridgetower and slapped Kreutzer's name on the Sonata No. 9, and now we don't even remember that Bridgetower existed. If you read the old accounts from, for example, ladies' diaries, members of the aristocracy who used to go to his concerts when Bridgetower was a young artist, they all talk about what an amazing technician Bridgetower was, and how much intensity there was in his playing. This is exactly what you hear in the Kreutzer Sonata. If you read accounts about Clement's playing, they talk about his refinement and delicacy. This is exactly what you hear in Beethoven's concerto. Rachel Barton Pine: Then we have Clement's concerto to make it even more obvious. Of course, Beethoven had his own very individual voice in everything he wrote, but also he very obviously tailored what he was writing to who was going to be playing it. The score to Clement's concerto was only recently published a couple of years ago by AR Editions. In his forward to the published score, the musicologist (Clive Brown) who pieced it together from the original source actually lists all the concordances. (Brown) also wrote the liner notes to my CD. There's a long standing theory that the rondo theme of Beethoven's last movement was actually written by Clement. Some people say that that must be so because it's a more lightweight melody then what Beethoven himself would have written. But why shouldn't Beethoven also write a catchy tune? Why should everything he compose be full of Sturm und Drang? On the other hand, maybe there is something to that story, because if you look at the theme to the last-movement rondo of Clement's D Major Violin Concerto, it's very similar. But does that mean that Clement wrote Beethoven's theme? Or does that mean that Beethoven wrote his theme based on wanting to write something that sounded like Clement? It's either one or the other, and both are equally exciting, because one realizes that they had such a close collaboration. All historical interest aside, the Clement concerto is a very worthy piece in its own right, completely separate from its relationship to Beethoven and his concerto. If you didn't know anything about any of that musicological stuff and you just heard it as a piece of classical period music you've never heard before, you'd say, "Oh this is a gorgeous piece." It can definitely stand on its own two feet. Of course, it's not a Beethoven, but I would say that it's every bit as good as everything else from the time that also wasn't Beethoven. It's really a great piece. Also, I wrote my own cadenzas for both concertos. I'm especially excited to be able to share my cadenzas to the Beethoven. Laurie Niles: Are you going to make them available to other violinists? Put them online maybe? Rachel Barton Pine: Nothing's been finalized yet, but I'm working on publishing a collection of all of my cadenzas and encores. I've written a number of virtuoso pieces, following in the tradition of Vieuxtemps and Ernst and those guys, and I've also composed cadenzas to Brahms, Beethoven, Paganini, Mozart, etc. I've now written enough stuff that enough people have asked for various ones. So I feel like it's time to go ahead and publish a collection of them. September 9, 2008 at 09:33 PM · Wow, great interview, Laurie! I particularly loved her points about how the concerto and the Kreutzer seem to have been tailored to the specific violinists. It's always interesting to hear about the rich histories of these great pieces. Looking forward to (and hoping for better luck in) the next CD giveaway! September 9, 2008 at 10:18 PM · I've been playing violin for about 50 years, and about 40 years professionally, but I have never or ever heard the Clement violin concerto. And, I have never even seen the music to it published anywhere . Interesting ! I'd like to know where to find the printed music for this Clement violin concerto . I remember reading that Beethoven dedicated his concerto to Clement. September 10, 2008 at 04:11 AM · I'll have to get this CD...I've always thought Clement wrote many more than just a single concerto (6 to 8? I'm away from my books)...yet all this talk makes it seem as there is only the one. September 10, 2008 at 07:14 AM · Clement did write a few other violin concertos as well as various other works, but his Concerto in D Major of 1805 is the one with the strong connection to the Beethoven. Just imagine if Beethoven had written a sonata for Clement and a concerto for Bridgetower, we would have two completely different pieces! September 10, 2008 at 03:48 PM · If you are interested in getting the music, I believe you can get it from AR Editions: click here! BTW for Internet newbies, anything that is highlighted, you can click on! Wonderful interview and fascinating information. The Beethoven is my all-time favorite concerto. Having read the recent book on Beethoven's Concerto, I'm really eager to hear the Clement, and your recording is on my list. And, as far as the historical record, it reinforces the belief that so monumental a giant as Beethoven would not have associated himself with a clown, but with a serious artist. And, also, that his concerto didn't spring from the air like some kind of lightening bolt from Zeus, but came from the influences around him. Can't the same be said for the influence of Vivaldi and others on Bach, and of Haydn on Mozart? September 11, 2008 at 04:29 PM · Concidentally fascinating, as the Beethoven Concerto has been on the CD player for the past month! Thank you so much for posting this very insightful interview - it's wonderful to see, simply by knowing that artists are writing their own cadenzas and publishing - that contrary to public belief, classical music is alive and well! Very much looking forward to hearing Rachel's recording. Thanks for all the efforts you are making expanding the repertoire and the research you accomplish.